Laveno, located by the Lake Maggiore in the region of Lombardy, is a huge tourist draw because of its remarkable panoramic view of the Piedmontese shore, and the Borromean Gulf. In fact, there were disputes between the Romans and Galli Cembri, Visconti, Sforza, Borromeo, up to Garibaldi and the Austrians over this land. Since the views are so outstanding, the visibility was a prime spot to foresee intruders approaching. The town is best known for its most prominent architectural landmark, the modern church of Sant’Ambrogio, built in 1935. The local buildings have beautiful facades and tourists enjoy walking along the promenade just to survey them. The Sasso del Ferro which dominates Laveno from a height of 1063 metres, allows visitors to enjoy dramatic views of nature. The peak can be accessed by the cableway or by walking along the ancient mule-track, which leads to the Casere. Laveno is so rich with inspiring vistas, that it’s a sure bet as a wedding destination. Several famous manufacturers of Italian pottery and china reside in Laveno. 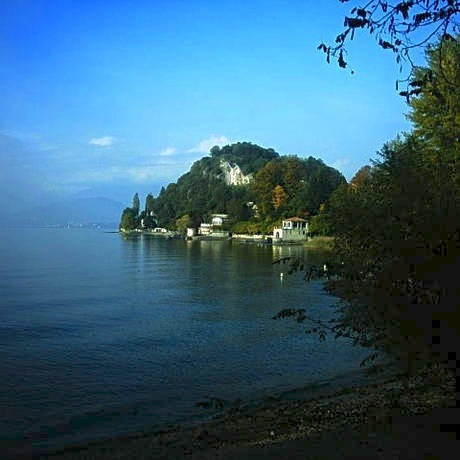 In Cerro, a resort on the southern part of Laveno, there is a lovely boardwalk along the beach and La Civica Raccolta di Terraglie, a museum of artistic pottery, created in 1893. In the nearby village of Cittiglio, at the gates of the Vacuvia, the renowned Museum Alfredo Binda contains unique artifacts and news about the sport of cycling. The ferries of the Lake Maggiore Boat Service leave every 20 minutes from Laveno, transporting passengers and vehicles to the Piedmont shore and the significant tourist areas of Verbano, such as Isole Borromee (Borromean Islands). Laveno offers a sense of calm and awe simultaneously, and is a sensational setting for a breathtaking marriage ceremony.